Southern California for the Holidays Brrrrrrrrrr!! Off to sunny SO CA to warm up – HA! I couldn’t wait to get out of Fernley and down to SO CA for the holidays. I will warm up for sure down there and enjoy all the nice sunshine. I stopped in Beatty, NV again where it was a bit warmer then Fernley but not much. Then headed straight to Orange County to visit family and friends. 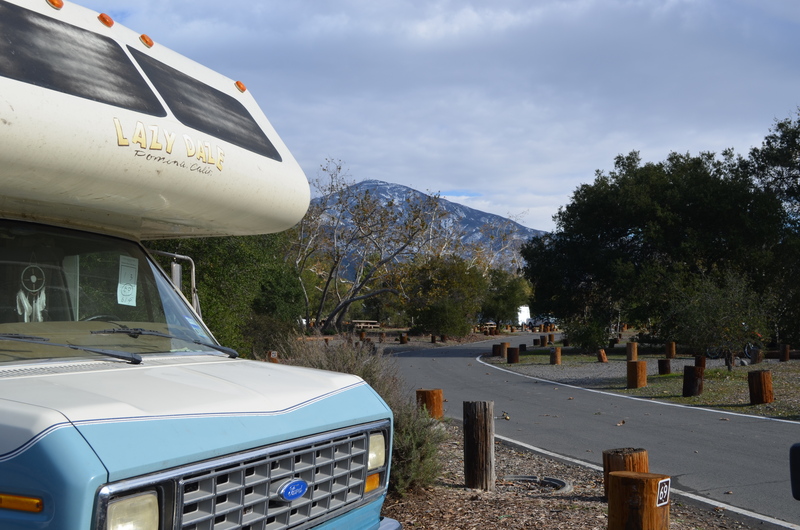 I stayed a few days in a pull through site at O’Neill Park. But then realized it was not a good site for either solar or WiFi so moved to a back-in site where everything is good. Great solar and 4G Internet. How could it get much better? Well as it turns out it could be much better. The weather was freezing. It seemed like I was back in Fernley. 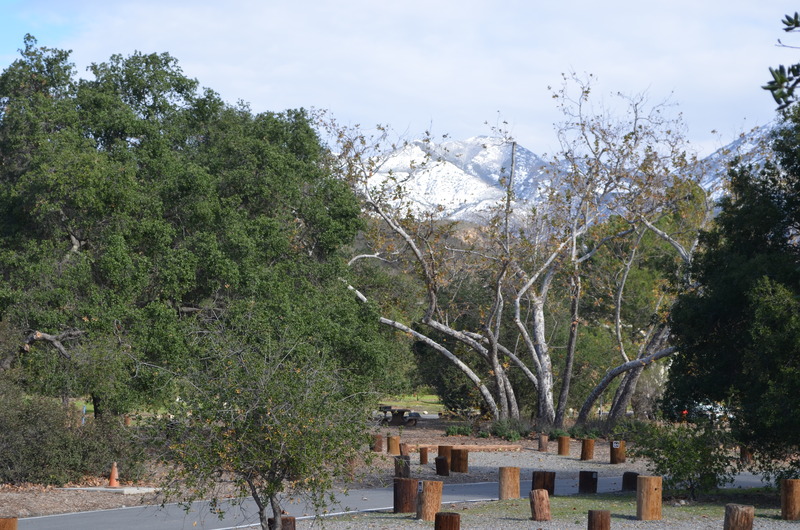 One night it rained on the valley floor but snowed in the Saddleback Mountains just a short distance away. 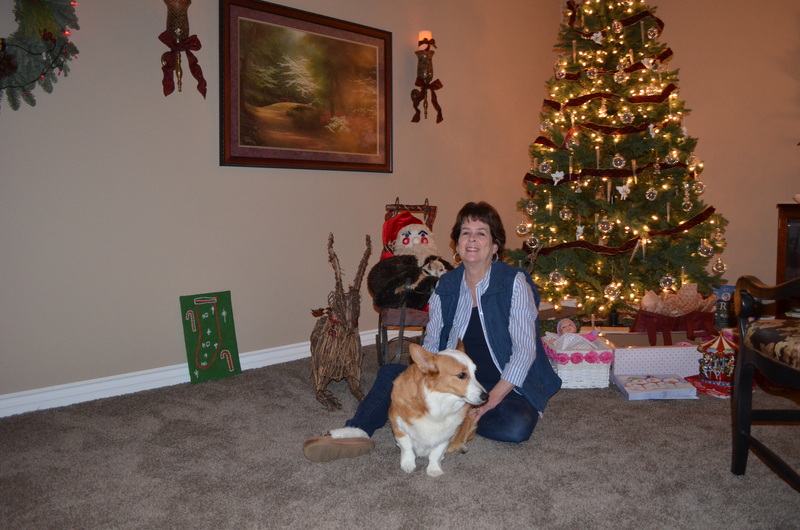 Chica and I went over to my sister Bev’s home and spent the holidays with she and my brother-in-law Bob. We had a great time and Chica was glad to see their dog Lando. They get along great and loved to run in the park. Bev and I took Chica over to see my Mom one afternoon. Unfortunately I didn’t get any pics. We did go back another day to visit her without Chica and I got this clip of her. She put on Bev’s glasses and was interested in going through her purse. HA! 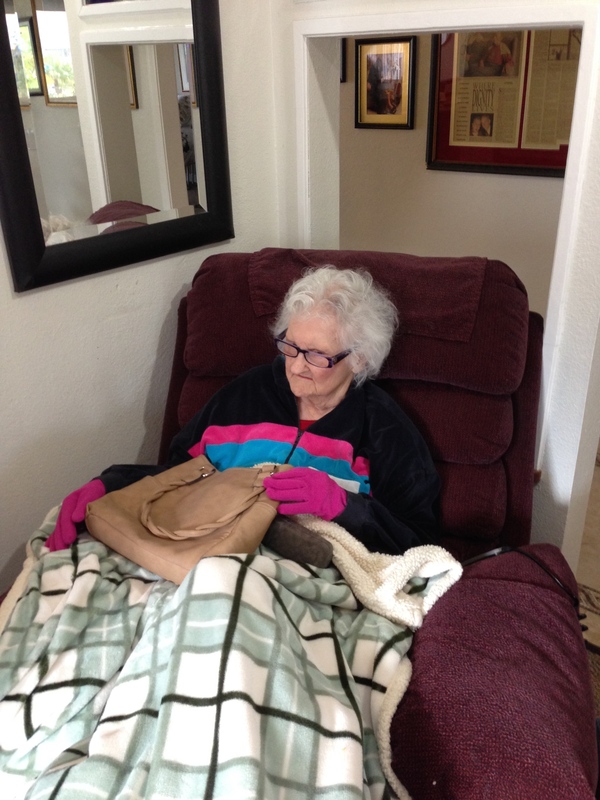 She is doing well but is very frail and doesn’t talk too much. It sure was good to see her though. 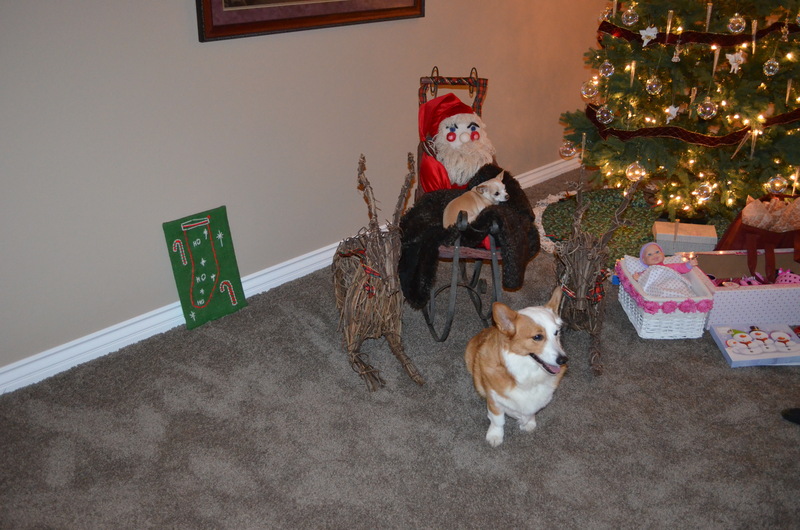 Bev and Bob have a cute Santa in his sleigh. 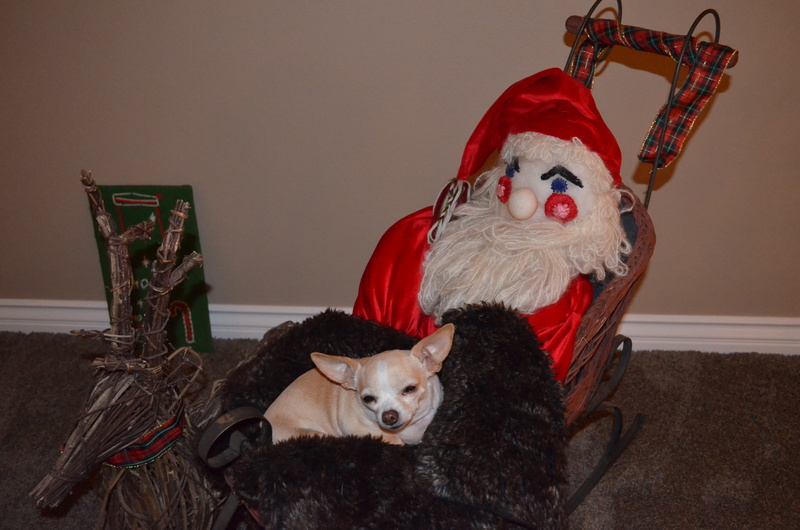 Chica fit in there perfectly and she was very content sitting on Santa’s lap. I’m sure she was wishing for lots of cookies and fun toys to play with. Here Chica is with Lando. Plus a pic of Chica, Lando and my sister Bev. In a couple of days I will be heading to the beach. I will spend a week at Doheny State Beach right on the ocean in Dana Point, CA. I have always wanted to stay there but it was always crowded and hard to get a reservation. It is supposed to warm up this week so looking forward to it. More pics to come. I usually get to Quartzsite, AZ around the 4th of Jan. This year I will be a bit late. I intend to arrive in Q on the 14th just in time for the show. I will be camping at Rogers 1/2 acre as I have done in the past. I hope to catch up with a lot of my friends when there. If you are heading there be sure to stop in and see us. It is a blast. 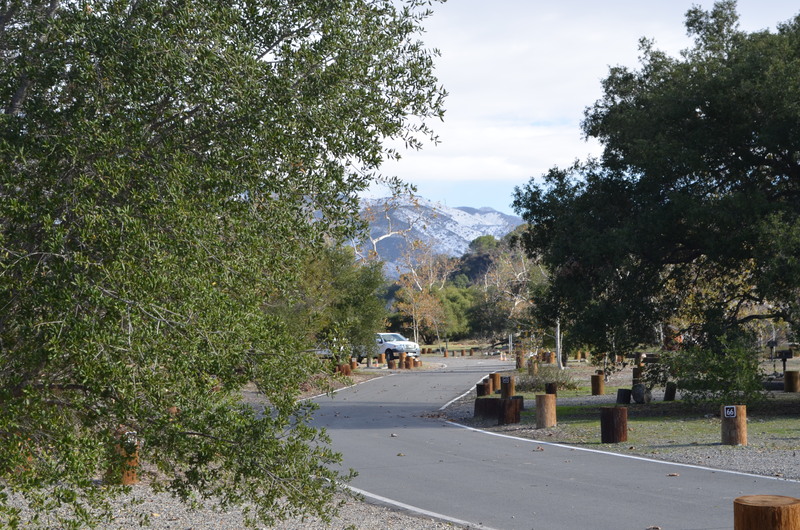 This entry was posted in Beatty RV Park, California, Chica, Fernley, Friends, Nevada, O'Neill Park, Quartzsite, Weather and tagged Chic, Family, Friends, Quartzsite by Jim Melvin. Bookmark the permalink. The Red Bird Dogs and I will be in Quartzsite on January 13th. See you there. Want to here first hand your 2014 adventures even though your blog does well in showing the world through your and your little dog’s eyes. Hi Jim I have been following your blog for a while. I enjoy reading about yours and Chica’s adventures. In two years time, I hope to be hitting the road full time also. My biggest challenge will be figuring how to make a living on the road. I do have skills as an administrative assistant. running an office and making miniature dollhouse rooms. I’m just not sure this would enable me to support myself. Do you have any suggestions? By the way, my name is Tammy. Hang in there – warmer weather this week. I’m so excited. Any chance you’ll come to our blogger fest on the 24th? Glad you enjoyed Christmas with family. Warm weather is on its way! Looks like I will be following your path. My last sticks and bricks was in Costa Mesa. I have a reservation at O’Neill, then Doheny. My youngest son is the only child left in California out of four. Heard it’s been very cold there. Someone I worked with, who lives in the Silverado canyon posted a picture on Facebook of his front yard, looked like Montana 🙂 Have a great stay. Hopefully the temp. begins warming up today. We’ll head to Roger’s 1/2 afterwards and look forward seeing you and host of others. We’ll see you in Q around the 19th or 20th. Looking forward to another year! We may only stay five nights this time but it will be fun regardless!